Most Internet Service Providers (ISPs) offer free spam-filtering services. Spam-filtering takes place when e-mails that are suspected spam are filtered out of your inbox. These e-mails end up in another folder, usually called Bulk or Quarantine so that you can double check if the mail is junk before deleting it. Sometimes the suspect e-mails will have a symbol or text next to them to indicate that they may be spam, this will depend on who provides your e-mail account. It is when you request to have your details removed from a mailing list that the spammer actually gets confirmation from you that your e-mail address is still active. This is another reason why you should never reply, no matter how tempting. 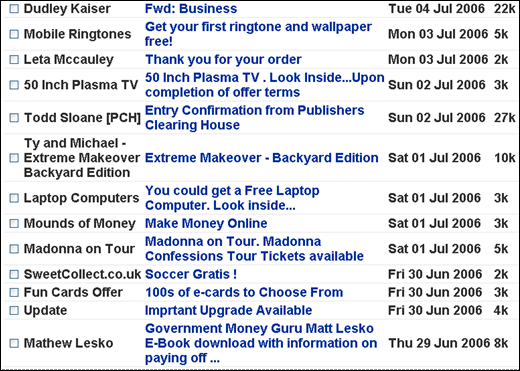 It is almost impossible to stop getting spam once the spammers have your address. If you are experiencing a lot of spam, the best thing to do is to create a new e-mail account and be extremely selective when giving out this new e-mail address.